Hear One Of The Most Anticipated AmericanaFest Performances: Sam Morrow : World Cafe If you're a fan of Little Feat, Tony Joe White and classic Lynyrd Skynyrd, this Los Angeles based singer-songwriter has it all for you. Sam Morrow and his band perform at this year's AmericanaFest Day Stage, presented by WMOT, NPR Music and World Cafe. 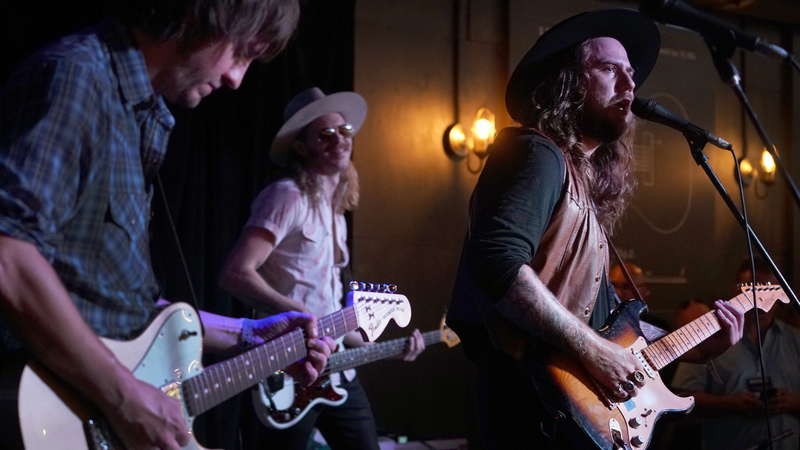 One of the most anticipated showcases at the Americana Music Association's AmericanaFest in Nashville in September was from Los Angeles-based singer-songwriter Sam Morrow. Like many of the artists at the festival, Morrow played multiple shows — six in four days with his band of roots-rockers. One of those was part of the Americana Day Stage presented by public radio station WMOT, NPR Music and World Cafe. A week of music at the small venue The Local featured a broad range of sets from diverse musicians in alt-country, roots-rock, bluegrass, R&B, blues and folk, including Richard Thompson, The War and Treaty, Kathy Mattea, Ruston Kelly, Asleep at the Wheel, Nicki Bluhm, Alejandro Escovedo and a rocking performance from the East Nashville band Cordovas. Morrow's set at The Local focused primarily on his latest album, Concrete and Mud, a must-hear collection of songs that blend southern rock with country and funk. Morrow's got a soulful vocal growl, and the band commanded a tight groove throughout the set. Guitarist Brian Whelan anchored the rock with a spot-on, barely-a-wasted-lick performance. The set opened with "Heartbreak Man," with other highlights including "Quick Fix," "San Fernando Sunshine" and "Skinny Elvis," a rollicking exercise in barnstorm twang. Morrow and the band also blasted through the road boogie jam "Barely Holding On" from his 2015 album There Is No Map, and he closed with "Paid By The Mile," ending the song with a sneaky quote of Don Williams' "Tulsa Time." If you're a fan of Little Feat, Tony Joe White and classic Lynyrd Skynyrd, then Sam Morrow has it all for you: He's the essence of Americana, blending together diverse styles of roots music, and his showcase set at The Local more than delivered on the anticipation for it. Hear it in the player above.